Skin spots to keep an eye on. As a rule of thumb: those moles that stand out from the others need to be checked. They could be asymmetrical, have a border, show multiple colors, are bigger than others, or are changing over time. Small red spots are most common, and are usually cases of ‘blood spots’ (petechiae) or an allergic reaction. In rare cases more dangerous causes are found. If you feel uncomfortable, self-check as a first step. 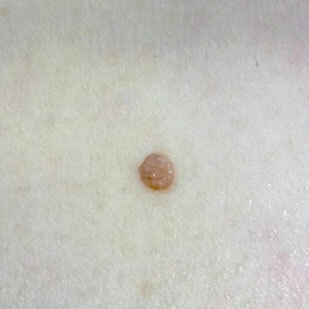 The most common white spots are ‘Idiopathic guttate hypomelanosis’. These white spots on the skin are usually caused by sun exposure. 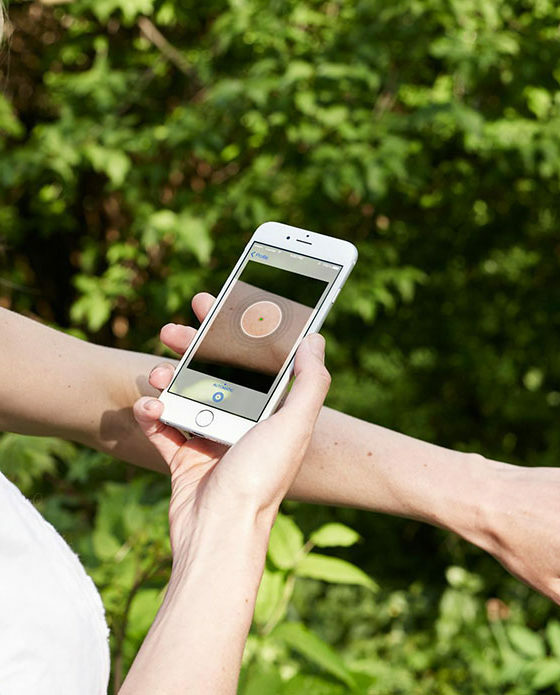 In the case of too much UV exposure, the skin cells can change in color. 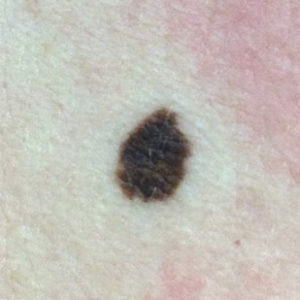 The ABCDE Rule of skin cancer is an easy-to-remember system for determining whether a mole or growth may be cancerous. They describe the physical condition and/or progression of any skin abnormality that would suggest the development of a malignancy. 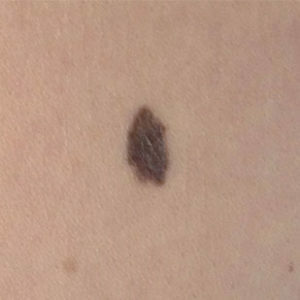 Moles that are not small and round could be showing symptoms that there is a risk. Imagine splitting a mole in half; if both sides are not identical, you should make sure to check the mole for skin cancer risk. 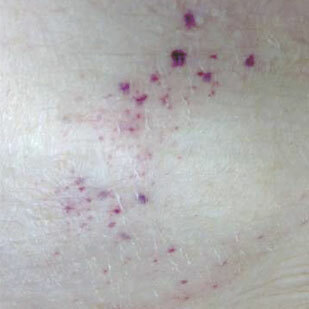 Do you see a border around the mole or lesion? This is not natural growth, and that mole should be checked out. Also if you see other colors than (light) brown, it deserves attention. 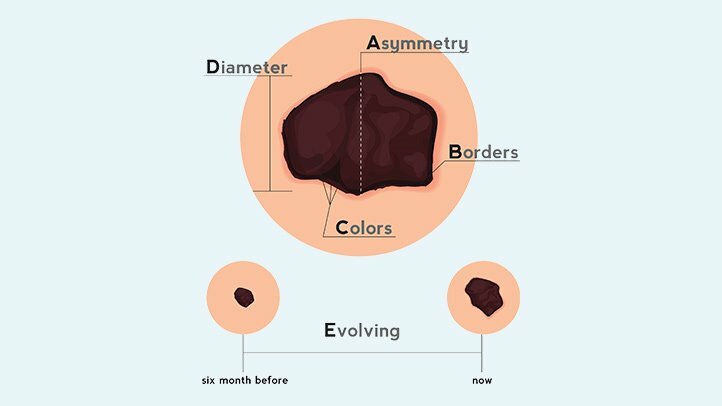 Moles that are changing over time are a cause for concern. This ‘evolution’ of a mole is not natural, and you should keep a close watch. When you notice changes, go and see your doctor. Ready to take the first Self-check for skin deseases signs? 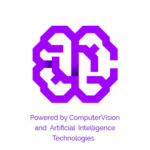 Start chat with Skinive Assistant in Facebook Messenger or Telegram and start checking your skin now. Where does skin cancer appear most often? Skin cancer is one of the most common forms of cancer and can appear anywhere on the skin. Non-melanoma skin cancers, like Basal Cell Carcinoma and Squamous Cell Carcinoma, are the most common. The first signs of non-melanoma cancers are often patches or lesions on the skin that show unnatural growth. Cases of skin cancer have been on the rise for decades now. When found early, most skin cancer types can be treated. That’s why it is important to check your skin regularly for any irregularities and see a doctor whenever you worry about something. While melanoma is the most dangerous form of skin cancer, it is still important to pay attention to non-melanoma skin cancers and understand the forms they can take. Skin cancer is caused by the mutation in the DNA of skin cells. But what is causing that mutation? In most cases, the answer is UV exposure from the sun. Both ‘normal’ day-to-day exposure when outside, and also from actively trying to tan. But skin cancer often appears in places that is usually hidden from direct sunlight, so there are other factors in play. Studies have shown that exposure to toxics can be a cause, for example from the environment that you live in. Also, genetics can be a cause of skin cancer. 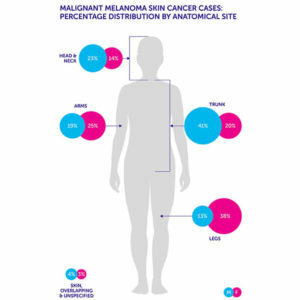 Skin cancer can appear anywhere on the skin, but as you can see in the illustration above there are a few places where skin cancer is more commonly seen. This has to do with several factors, such as the amount of sun exposure on a certain area and genetics. As you can see, some of these places might be hard to check for yourself. You can use the help of a partner or friend if needed. Most asked questions about skin cancer. If you have been diagnosed with skin cancer you will be discussing treatment options with your doctor. Of course this depends on the type of skin cancer, the stage, and other factors. But it’s good to know which treatment options are commonly available and what they mean. What are all the symptoms of skin cancer? Most cancers have some pretty obvious signs; lumps and bumps, tenderness, pain or sickness. But when it comes to the symptoms of skin cancer, they aren’t always as plain to see. Skin cancer is slow growing and often free of glaring warning signs. This can make early detection tricky. What if a mole itches? Many doctors identify painful or itchy skin lesions as an indication or warning sign of skin cancer. Although not the only sign or symptom, itchy skin is amongst one of the features associated with skin cancer. If the diagnosis is superficial skin cancer (like Basal Cell Carcinoma), then a biopsy removing all the tissue involved could be treatment enough. But in other cases, further steps are needed. How does skin cancer affect the body? How skin cancer affects the body heavily depends on the type of skin cancer that occurs. There are 3 common types: squamous cell carcinoma, basal cell carcinoma and melanoma.